As I’ve spent time with other children’s and youth ministry leaders over the years, I’ve noticed that the idea of “family” ministry has seen a resurgence amongst churches of various denominational backgrounds and sizes. However, many peers in ministry (and you might be one of them) have been given the role of “Family Ministry” without being told what exactly that title means. For many churches, the assumption is that, once someone is given the responsibility of “Family Ministry” they’ll simply run a couple “Family” events during the year and meet some sort of unspoken quota by which families will then feel cared for and invite their friends to the church. Though family ministry is more than simply just running a couple picnics during the year for your congregation, it’s important to ask yourself 3 questions before planning a Family Ministry Event at your church. 1. Would a Dad want to Show Up? I begin with this question as someone who has written and spoken at great length about reaching out to modern families and understanding that not all families have a father present in the home. Also: not every dad is the same – offering an electronic shooting range during the event or a BBQ competition isn’t the simple answer to getting dads to show up. It will take some time for your team to think about dads in your context and what kind of an event would draw their attention. With that said, your most effective Family Ministry events will be ones where dads are excited about bringing their families. When marketing a Family Ministry event, keep in mind that you’re often not marketing to the children in the family – they’re not the ones who will be driving the family there anyways. Instead, parents are your primary audience and churches tend to struggle at creating events that husbands and fathers want to attend. If you’re planning an event that you want the entire family to show up at and you cannot name why a dad would want to attend, you should start your planning over. 2. Why would a Family Bring a Friend to this Event? If you’re unable to name why a family would want to invite a friend to your event, the answer might be closer than you think. For some churches, large events provide a chance for visitors to spend some time at the church outside of a worship service as a first step into church life – attending a Back-to-School carnival is less intimidating for some neighbors than attending services on a weekend. For others, Family Ministry events feature inspirational bands or speakers who can craft a message that offer families an encouraging word in the midst of busy and hectic lives. Whatever your answer is – make sure that you can name why a family would want to invite a friend to your next event. If they don’t know why they’d invite a friend, chances are that they won’t. 3. What’s the Next Step for a Family who Attends? It’s easy for those of us in church work to feel as though we’re becoming cruise directors at times – we run so many events that it’s easy to forget that we’re actually in the business of seeing lives changed by the Gospel of Jesus. So, before you plan your next event, consider what the next steps are for a family who attends. Are you creating a clear path from that event into your next weekend worship gathering? Do you have clear invitations available for parenting classes or small groups that you want to direct parents toward? Every event that you host at your church should lead a family toward a next step in their journey of faith – even if that next step is simply to go home and have a discussion at bedtime that night about where they’ve seen God at work in their lives during the week. However – families won’t know that’s your objective unless you’re intentional about what your goal is for each event that you host and what you want a family to do next after attending. Though Family Ministry is SO MUCH MORE than running events, there is an expectation in many of our churches that we’ll run events for families during the year. Because of that, it’s up to you to make sure that you’re answering the three questions you need to be asking in order for those events to be successful. My first job offer was written on a Burger King napkin over 12 years ago. My 1st rough draft of “Things I might say when I propose” was written on a yellow napkin from Susanville’s Frosty Mill 8 years ago. It was nearly 3 years ago when I wrote my 5-year ministry plan on a napkin I found in our kitchen after moving to Southern California. 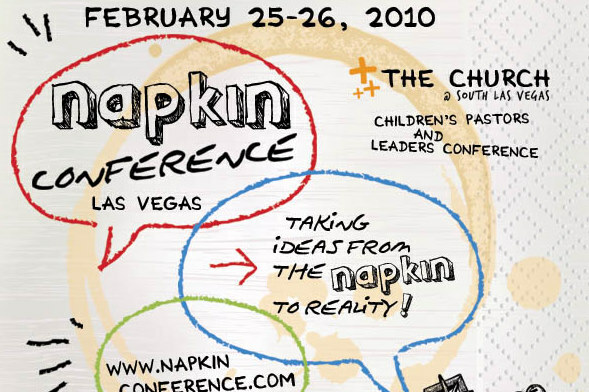 In February 2010, I’ll be bringing a handful of napkins to Las Vegas. At the Napkin Conference 2010, I plan to hear about that journey from guys like Sam Luce and Jim Wideman. If you’re on the West Coast, you need to get to this conference. We’ll meet up and share ideas. We’ll even share some napkins. It’s not too early to plan.